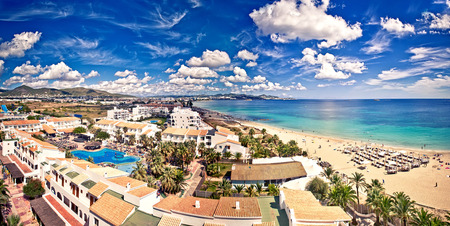 Playa d'en Bossa is a very popular resort close to the capital in Ibiza. If you are looking for a guarantee of summer sunshine, soft sandy beaches and warm seas, a holiday to Playa D'en Bossa may be just the ticket. We have a surprising number of cheap Playa d'en Bossa holidays which offer great value as our commitment to quality and service is never compromised. Holidays in Playa d'en Bossa can be as relaxing or as active as you wish since they offer a wealth of recreational activities both in and out of the water. The resort has a wide range of accommodation, a plethora of eateries catering for all palates, bars, discos and clubs providing lively evenings, and local shops, as well as those in nearby Ibiza Town, supplying retail opportunities for even the most avaricious of shoppers. Playa d'en Bossa holidays can be taken from early April to late October when temperatures range from low twenties to mid thirties. If you wish to escape the vagaries of our British summers, surf through our low cost Playa d'en Bossa holidays and you may find one to suit. For further information, and to view our latest Playa d'en Bossa holidays, use the search facility.